Wow! Let me state right off that, while reading the quick start guide included in the TOS Travel Kits book, I wondered at first why anyone would need to buy this book after hearing the idea. The idea is great, but does it require a whole book? Let me answer in the affirmative. 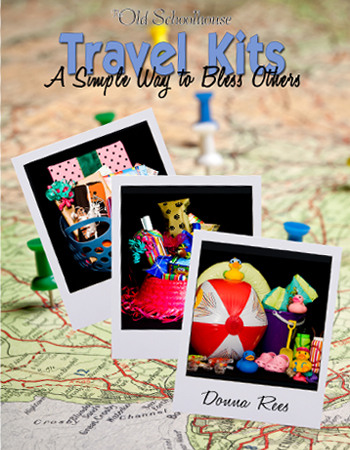 After reading through the rest of the book, I now get it – this whole idea of creating, giving, and using travel kits! What exactly is a travel kit? It’s basically whatever you want and/or need it to be – a collection of goodies to keep the kiddos occupied on a long car (or plane or boat or …) trip. As defined in the book, it is a “collection of items that will entertain and/or delight the passengers.” Sound like a good idea? It is! You can make these kits for your own family or spread the cheer to another family who is taking a trip. You can bless young children all the way to adults. How does it work? Basically, you decide what to include in the gift by considering the ages of the recipients, the amount you wish to spend, and the size of the vehicle the recipients will be traveling in. You can make, find, or purchase items to put in your travel kit. The book provides oodles of ideas for all ages – things to find on the internet, things to make by hand, things to borrow from the library, and things to purchase. Collecting all the items together is fun, but it’s only part of the fun. The most fun comes in wrapping each item and finding the perfect “box” to put them in for presentation. Look at the ideas on the cover and you’ll see why the word “box” is in quotes . 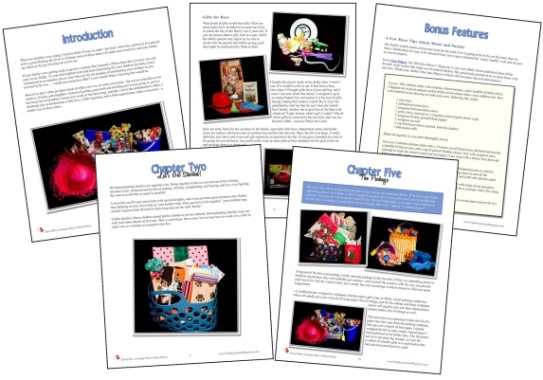 The book provides several ideas for how each item should be opened (every 40 miles, every pit stop, every hour …) and how to determine which gift is for which person. The book also provides lots and lots of ideas for gifts, lists and links to online resources, and lots of images and inspiration. When my eldest daughter comes back from camp, I’m going to ask her to help me put a couple of these together for our family and our friends. I know we will enjoy working on them together. In short, I would recommend this book to anyone looking for a great new gift idea – either for friends or their own family. The possibilities are limitless and so is the fun to be had for everyone! The Travel Kits e-book is available through The Old Schoolhouse Store for $12.45. Go get the book and get creative! Disclaimer: I was provided a free copy of the product in exchange for my genuine and unbiased review.